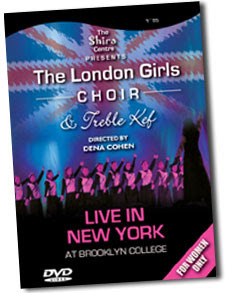 The long awaited DVD of The London Girls Choir is finally here - and here to stay!!! With most songs taken from the 2007 Succos concert in New York, now you can watch Dena Cohen and her talented girls in action! Featuring some stunning performances from Treble Kef, with beautiful singing, dramatic dancing, and multi-layered harmonies. The London Girls Choir will delight you, as always, with an audio-video feast, singing hit songs, Mo Rabu, Avrohom Yogel, and many more! The sheer creative genius that Dena Cohen puts into the songs, lyrics, harmonies, choreography, music arrangements and overall presentation, is simply unparalleled, and this is one DVD you'll want to watch over and over again.